"I prefer Benson & Wedges"
I like to put them on some bread, I roll my own. Do you have any Golden Vinegar? You wouldn't get those in Mayfair. "No, thanks... I've got my own Maris Pipe. Anyone got a mash tray? "Can I have some tar tar sauce?" "What's this? I asked for chips and faggots!." 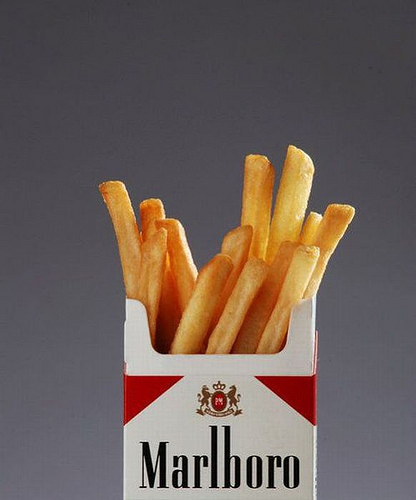 Marlboro Fries – Medium and Mild! Sturgeon General's Warning: There's really no need to add fish. Beware now Davy, those things will see you in the gravy. Ah, McDonald's have increased their standard portion size. "D'ya know what I prefer in the mornings? ………. smokey bacon, really hits the spot"
I call it 'The Walter Raleigh'. I am trying to give them up ……. tried potato patches but they start to smell after a while so I've moved on to e-chips. This is how I burn my calories. Don't put salt on them, it's bad for your health! "Do you want a chip?" "No thanks, I'm trying to give them up"